• Block 1, 2, 4, Greater Nile Petroleum Operating Company (GNPOC). The shareholders are CNPC (40%), Petronas (30%), (ONGC) (25%) and Sudapet (5%). • Block 6, China National Petroleum Company CNPC (95%) AND SUDAPET (5%). • Block 3&7, CNPC, 41%, PETRONAS 40%, THANI, 5%, GPC 6% and Sudapet 8%. Petroleum (32.5%), Kuwait Foreign Petroleum Exploration Co. (25%) and GPC (10%). • Block 5B, Petronas (41%), OMV (24.5%), IPC (24.5%) and Sudapet (10%). The Ministry of Energy and Mining has adopted the block system. 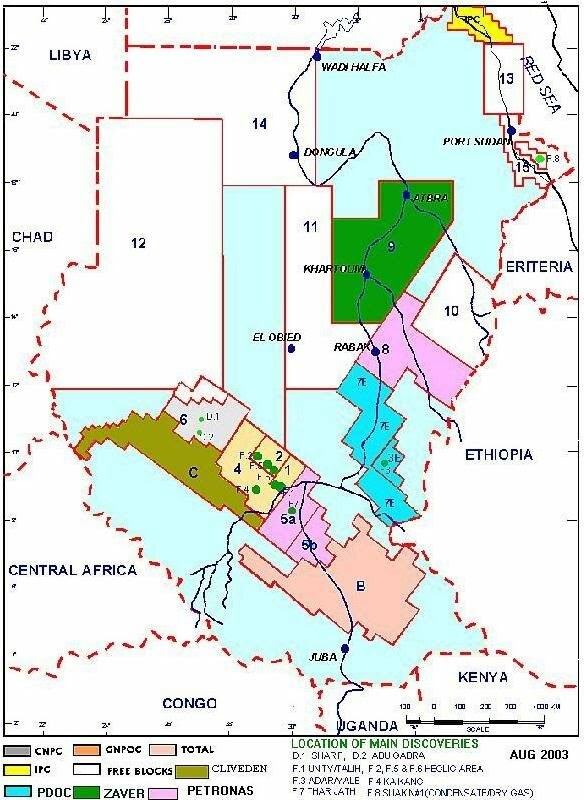 Since 1992, accordingly the Sudan basins were divided into a number of blocks based on the amount of geophysical, geological and drilling works done Fig (5) and table (2&3). Most of these blocks are free for contracting with any company or a group of companies, which are capable financially and technically to do the work. All data for the free blocks are available in the Sudan route.